In a previous article I looked at the dc resistance of conductors and in this article we turn our attention to ac resistance. If you have not read the previous article, now may be a good time to do so. The ac resistance of a conductor is always larger than the dc resistance. The primary reasons for this are 'skin effect' and 'proximity effect', both of which are discussed in more detail below. In a previous article I looked at the dc resistance of conductors and in this article we turn our attention to ac resistance. If you have not read the previous article, now may be a good time to do so. The ac resistance of a conductor is always larger than the dc resistance. The primary reasons for this are 'skin effect' and 'proximity effect', both of which are discussed in more detail below. There are various methods to take into account these effects, but I'll concentrate on those given in IEC 60287 (Electrical cables - calculation of the current rating). In addition to being widely accepted, the method is also part of a standard which gives it some legitimacy. While the above formulae is pretty straight forward, working out the skin and proximity effect factors is a little more involved, but still not too difficult. As the frequency of current increases, the flow of electricity tends to become more concentrated around the outside of a conductor. At very high frequencies, often hollow conductors are used primarily for this reason. At power frequencies (typically 50 or 60 Hz), while less pronounced the change in resistance due to skin effect is still noticeable. Proximity effect is associated with the magnetic fields of conductors which are close together. The distribution of the magnetic field is not even, but depends on the physical arrangement of the conductors. With the flux cutting the conductors not being even, this forces the current distribution throughout the conduit to be uneven and alters the resistance. The formulae for the proximity effect factor differs dependant on wether we are talking about two or three cores. If anyone has any comments or anything to add, please do so below. I can't help but notice that the cause of the proximity effect is very similar to cause of inductive reactance for a coil. When you're working out calculations for a coil, especially one for high frequencies, is the proximity effect factor independent of the inductive reactance, or is it a part of the reactance? Ok, thanks. Now I understand it better. Is there any specific instructions about the equations of the skin effect and proxity effect, I have seen these equations many times ,but i don't konw its source. 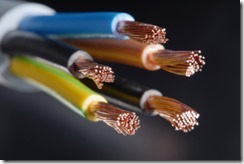 The equations I have quoted are from IEC 60287 - Electrical cables - calculation of the current rating. You can also find a few books and papers on the subject if you search around. If I remember correctly (have lost my copy), a book by S.Y.King and N.Halfer, titled 'Underground Power Cables' has some discussion on this. after some frequency the Rac became canstant why ? This article gives an introduction to IEEE 485 method for the selection and calculation of battery capacity.